Something wonderful happened at Stan Lee's Comikaze. As you know, I LOVE the web series, The Lizzie Bennet Diaries. I love the series so much that I did one of my VlogTalks about it. You can watch it below. This review was so inspiring that it actually got my mother to watch the series - yes, my mom. And even my brother and my dad. Wow! I must have been VERY excited about this series. OK, so I'm all hyped up to go to Stan Lee's Comikaze at the LA Convention Center. I get my copy of the fun filled weekend schedule that the convention puts out and, lo and behold, the cast of The Lizze Bennet Diaries is going to do a panel discussion. Well, obviously, for me, this is a non-brainer. I MUST go to this panel, even if it means missing the Dr. Who Cosplayer's gathering that was scheduled very close to this panel time.Sigh... the hard decisions of a cosplayer. So, I get to the panel discussion room early and get a super great seat - 3rd row, center seat. Yep, GREAT seat. The Lizzie Bennet Diaries Panel at Comikaze. The panel is AWESOME! Everyone in the cast is so cool and tell great stories. I even get a chance to ask a question about how they made the web series so addictive. They said it was because they used the concept of a "mystery box." It made you want to keep watching to see if they would show something they were talking about, but not showing. Well, it sure worked. OK.... so, now comes the super good part. I stayed around at the end of the panel to take pictures with the cast. 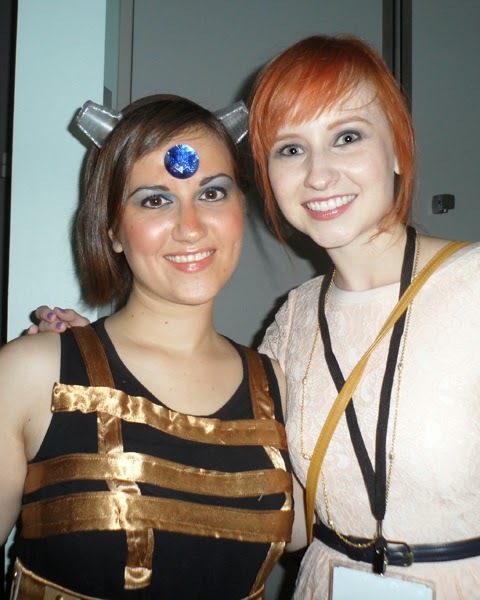 (see them below) When I got to Ashley Clements (the star of the show), she insisted someone take a picture (on her iphone) of her with ME because of my awesome Dr. Who Dalek costume!! Talk about a validation! This is truly why I cosplay! She then instagramed the photo. 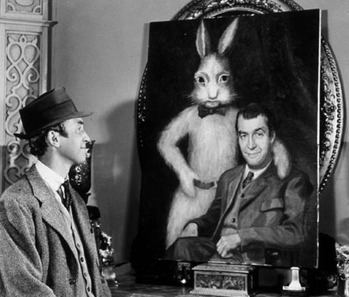 SEE it? Here it is!!!! Awesome!! 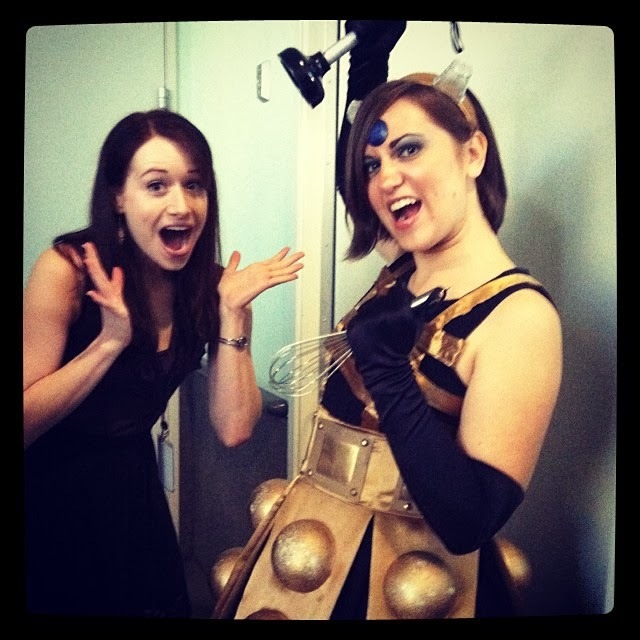 Lizzie Gets Exterminated - Madison Brunoehler as a Dalek with Ashley Clements of The Lizzie Bennet Diaries. Here's a little known fact, both Ashley and I are in Video Game High School Season 2, Episode 1. We're even in the same scene. How cool is that? 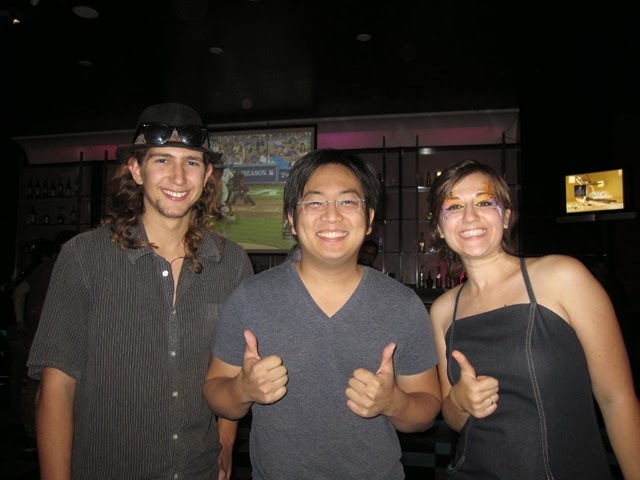 So, here are the other fabulous cast members that I got my picture taken with. Here I am with the amazing actress Mary Kate Wiles who plays Lizzie's sister, Lydia Bennet. 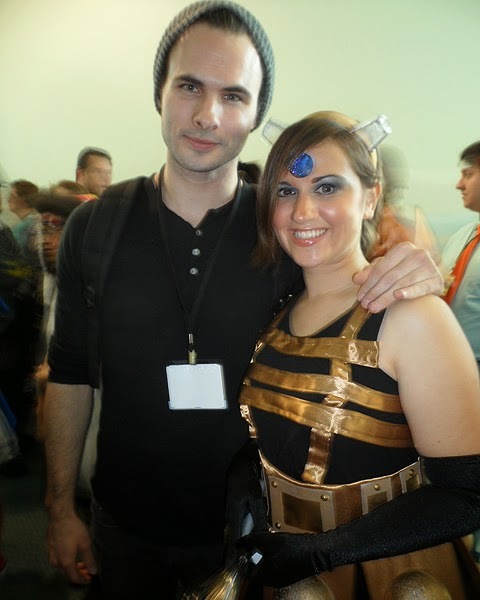 Here I am with the oh-so-gorgeous Daniel Vincent Gordh who plays William Darcie. So, that's my fabulous story and why I love to cosplay! 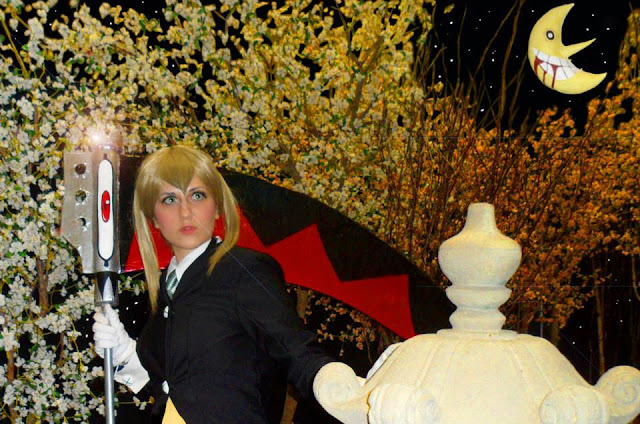 I love my experiences cosplaying at conventions. For those of you who don't know what that means: Cosplay = costume play; Conventions = anime conventions, comic cons, etc. Conventions take place in HUGE venues. The tickets can be expensive, the travel can be expensive, the housing can be expensive and so can everything else involved. I spend months preparing my costumes, so when I finally get to the convention (which I LOVE!!!) I certainly don't want the whole thing to get ruined because I didn't bring the right stuff with me. And, I don't want YOUR convention experience to be ruined because YOU didn't know what to bring with you to the convention floor. So, I've made this tutorial for you. What do you bring to conventions? Did I leave anything out? 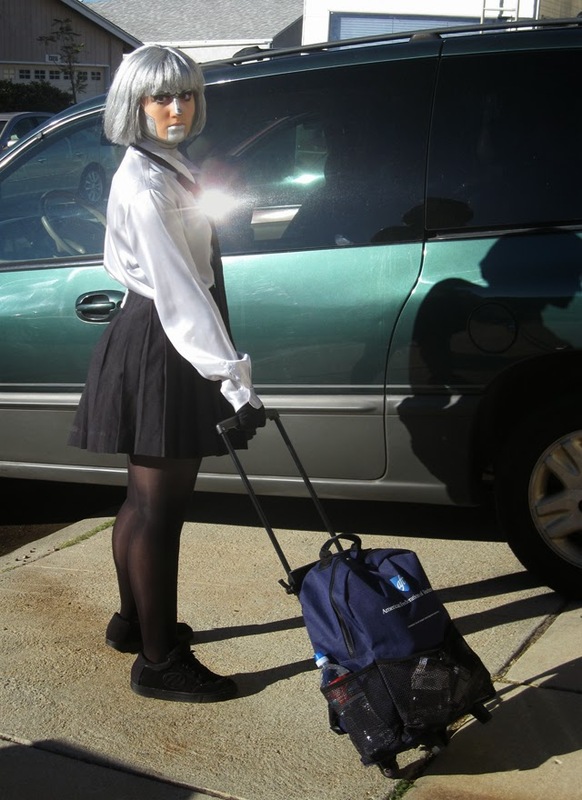 Here's a picture of me as K8 heading out the door to go to Stan Lee's Comikaze. My bag is packed and I'm ready to go. 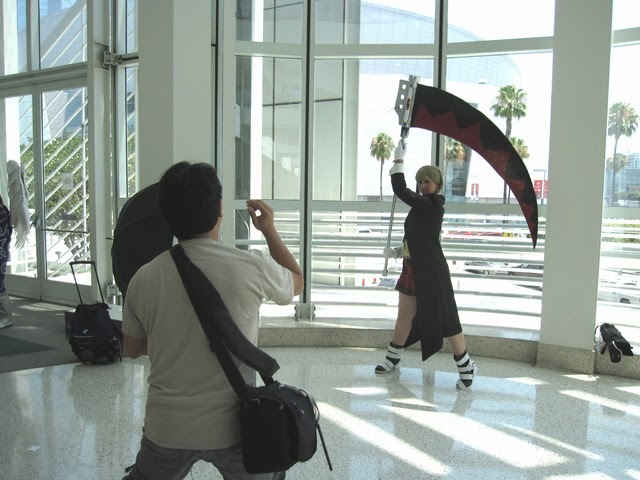 Here's a picture of someone taking my picture at Anime Expo 2013. Can you see my bag over on the side. It was super easy to just set it down so my picture could be taken. 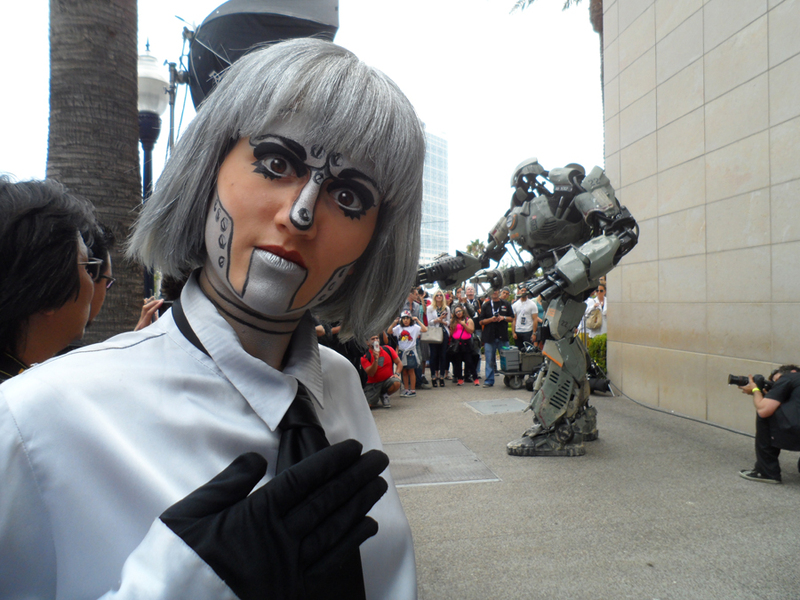 And with this costume, I surely needed everything in my bag to keep it together for all three days of the convention. What would happen if Lucy drank coffee? Quite excited to be able to show everyone the world's first and only freestyle rap about the subject of Knitting. With a special thanks and intro by Madi2theMax's Martha. The Indi.com Martha's Knitting Rap section of this video was produced by DolceFilms.com. Produced, shot and edited by Bayou Bennett and Daniel Lir. Martha's Knittin' Rap is currently in competition on indi.com. This wonderful video was produced by DolceFilms.com. Directed, filmed and edited by Bayou Bennett and Daniel Lir. Written by Steve Brunoehler and acted by ME (well, the me that is my British character, Martha.) Oh, yes, and inspired by my long line of knitting kinfolk. 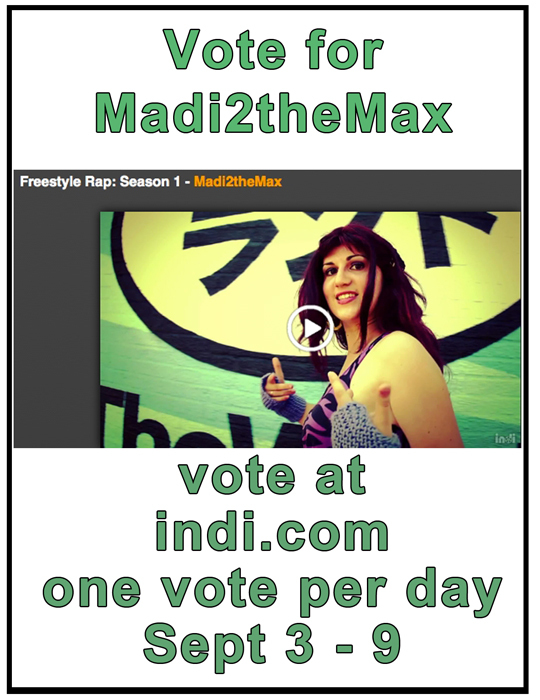 Please vote for my video at http://indi.com/t/E27DAE0B. So, if you want to have a sweet day, then figure out how to work with the incredible, amazingly talented and creative team that is Bayou Bennett and Daniel Lir of Dolce Films. Unfortunately, I can't tell you exactly what we were shooting today, but I will tell you that it was "Martha" on set and she was doing something pretty unexpected. The age old question - What do you want to be when you grow up? - big question with lots of answers... some are a surprise. Joseph Gordon-Levitt posted this picture to his facebook page today. 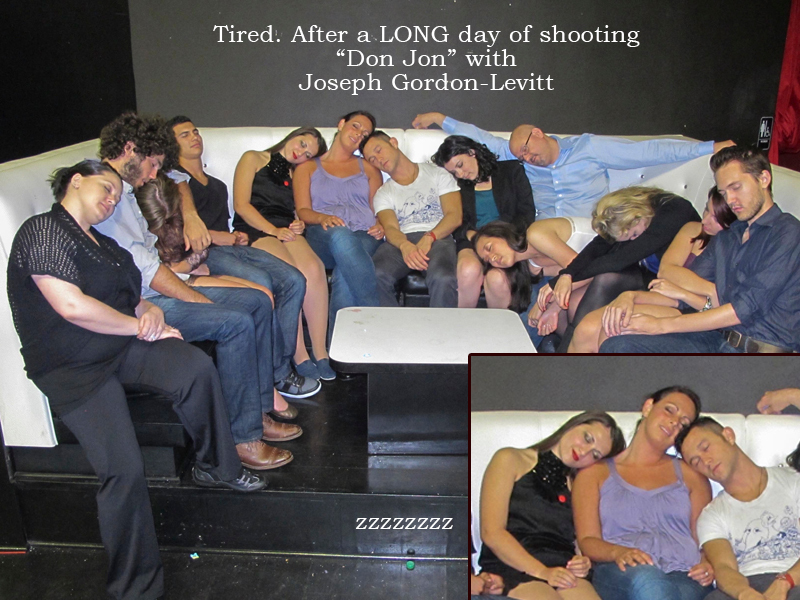 Yep, that's me right next to the "1" having a great time on the set of "Don Jon." Just so you know, Joseph (just regular Joe as he likes to be called) is one of the most incredible, gracious, hardworking stars I have ever had the privilege of working a 14 hour day with. 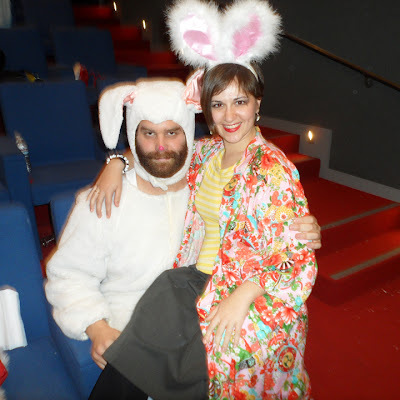 Here I am with my bunny ears, sitting on the lap of Harley Morenstein, of Epic Meal Time, dressed in a bunny suit. What?? The answer is quite obvious when you watch Episode 5 of Video Game High School. Sometimes you just have to step out of your comfort zone and tell it like it is. The truth about fairytales. Did we meet at The Geekie Awards? 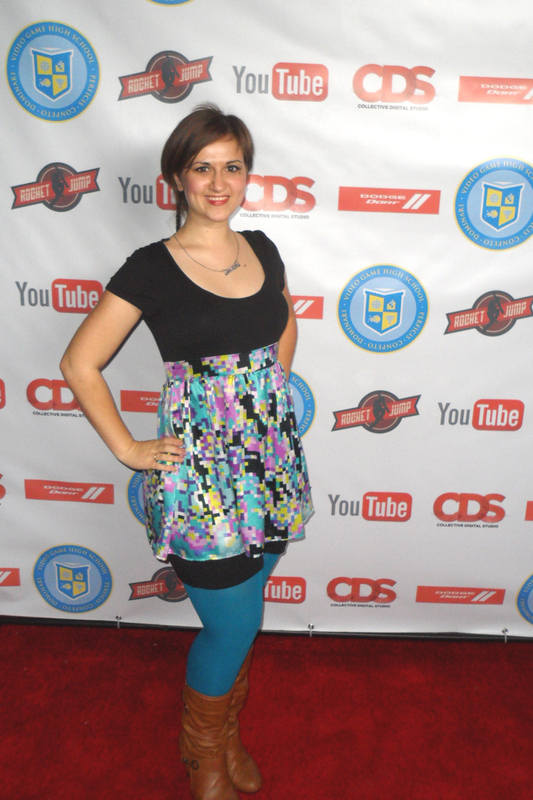 Had soooo much fun at The Geekie Awards. Met the coolest people. Saw some old friends. Saw Stan Lee give a great speech to the nerd and geekie world he has spawned. Priceless. 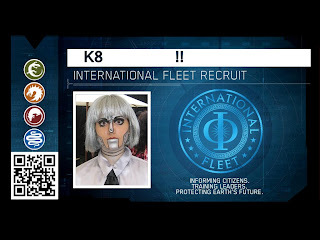 Oh, right... did I mention that I went as K8? The Geekie Awards and the Geeks with K8. 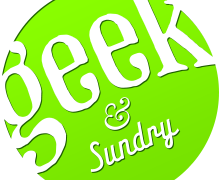 Loving all the great people and experiences at The First Annual Geekie Awards with Andre Meadows aka The Black Nerd, Megan Westerby and Marissa Zaenger of Collective Digital Studio, The Winner Twins, Keahu Kahuanui of Teen Wolf, R2D2, FilmBreak and Dr. Kevin Grazier (yep, the science adviser for Battlestar Gallatica) . 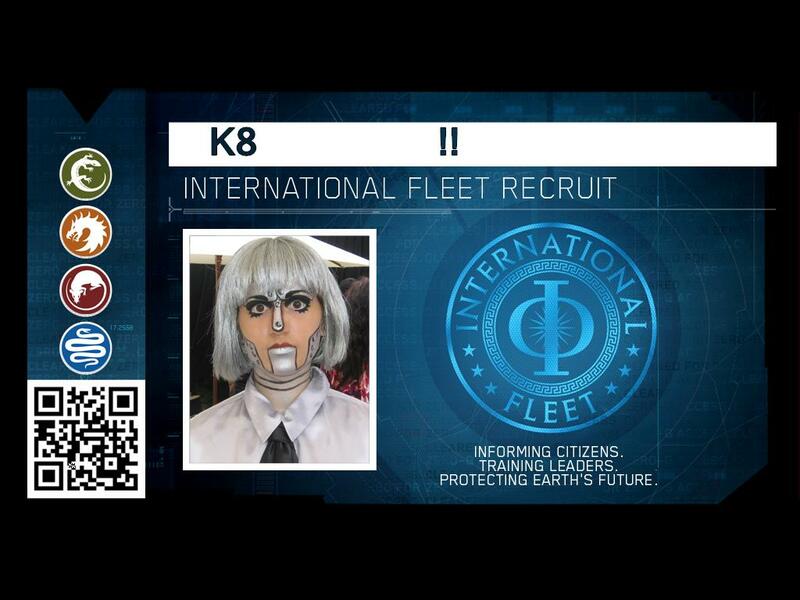 I'm pretty sure that K8 would consider this information "classified" but here is her International Fleet ID card. 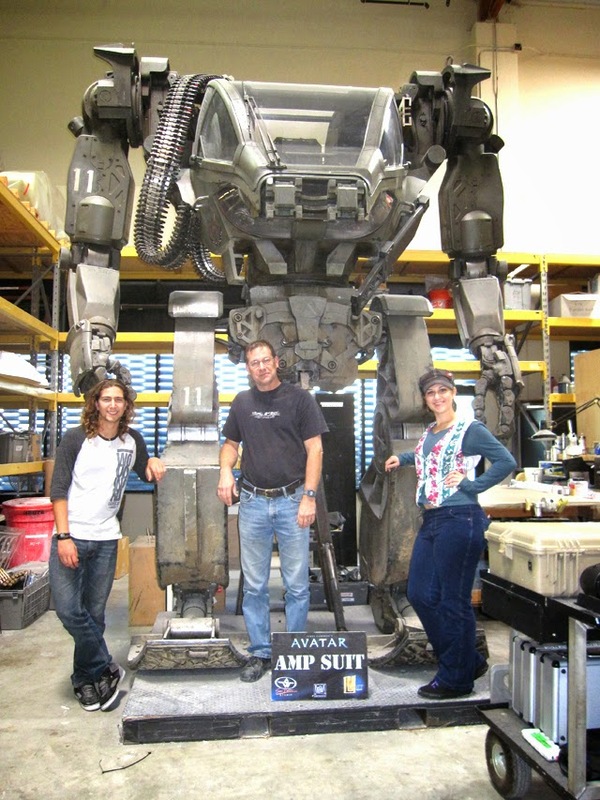 Here is another shot of K8 in front of the entrance to the battleroom of Ender's Game. What IS she doing there? You never know with K8. How exciting. 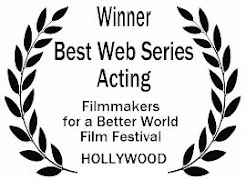 I was awarded Winner for Best Web Series Acting at the Filmmakers for a Better World Film Festival in Hollywood, California. 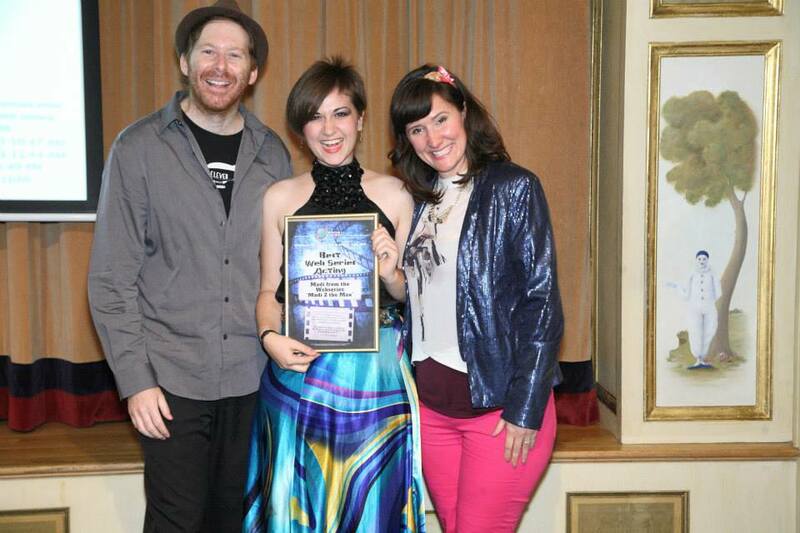 Here I am with the fabulous creative team of Daniel Lir and Bayou Bennett of Dolce Films. What a great night! 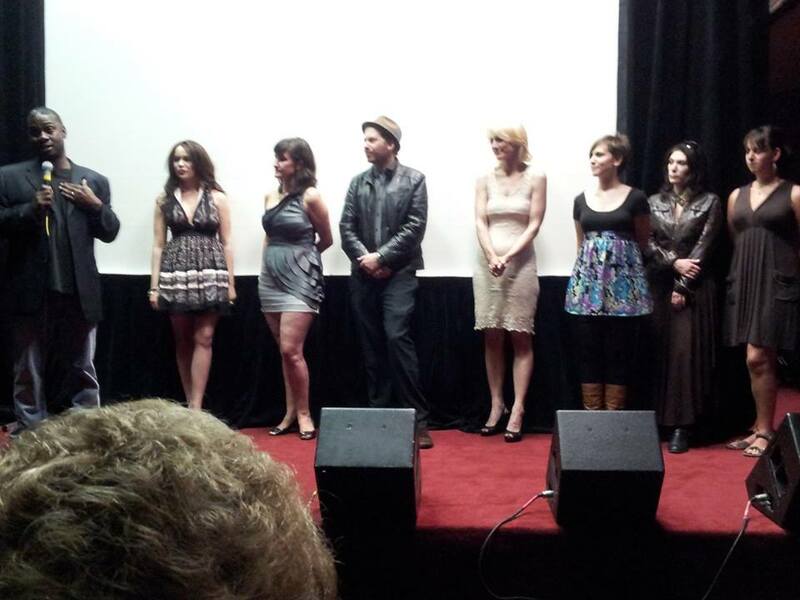 Here's a picture of me up on stage, with some of the cast and crew, at the premiere of Aleigh O'Sullivan's new music video, "Al Fine" at S.I.R. Studios. 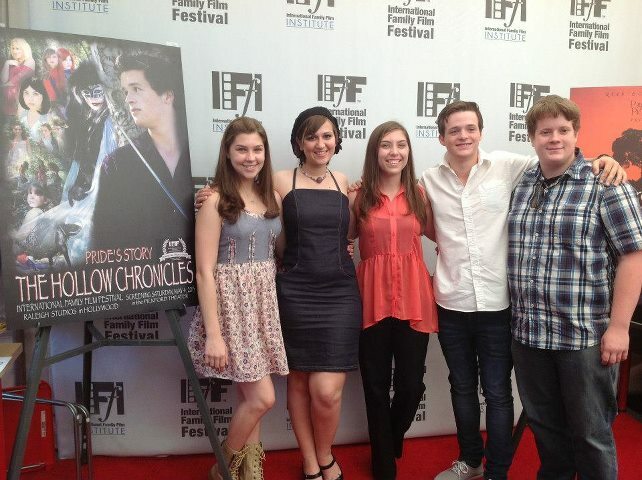 I love working with Daniel Lir and Bayou Bennett of Dolce Films and Koura. Thanks guys. I always have a great experience working with you all. Oh yeah... the music video is insanely beautiful! It is one of the short films that will be shown at the Artists for a Better World Film Festival (along with one episode of Madi2theMax.) See you all on Sunday!! TV shows? What do you watch? Wow! People surely have different opinions about TV shows. What do you think is Lucy's favorite show? That's right, folks. 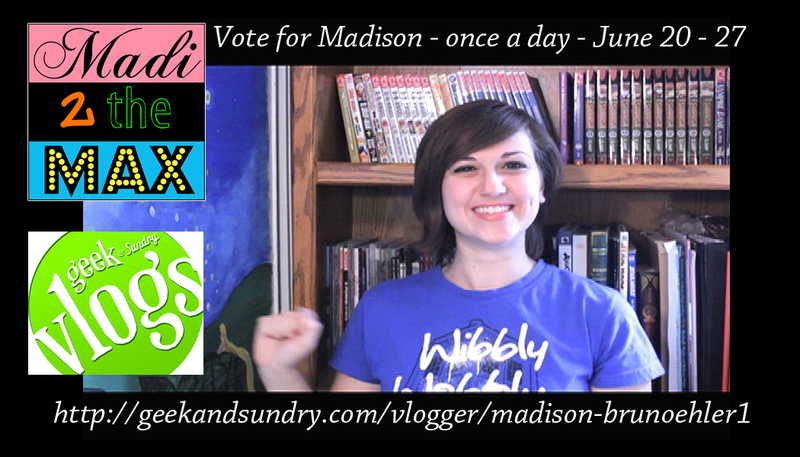 My "Teen Wolf" review Vlog is a contender in the Geek & Sundry Vlog Competition. When I win one of the coveted 10 spots, I will get mentoring from the best in the industry and get lots of new viewers. Hooray! 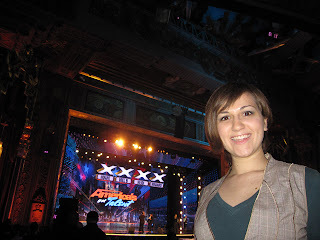 You will see my video ... smile! You don't have to register or anything. Just click on the VOTE button on the top right hand side of my video. That's it. So, thank you sooooo much for helping. Thank you sooooo much for watching my videos. 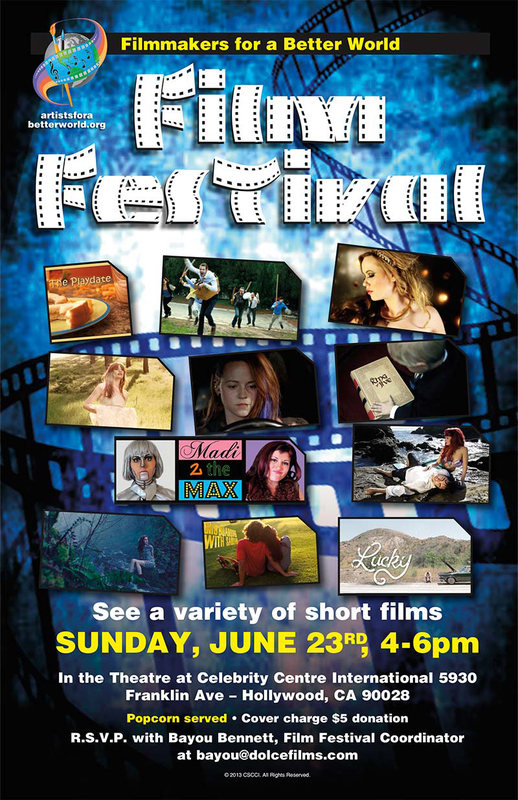 We're* in a film festival!! So excited! Madi2theMax has been chosen to be one of the shorts in the Artists for a Better World Film Festival in Hollywood, California! 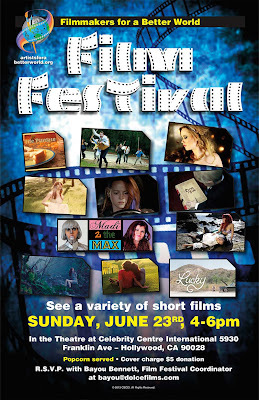 I am so very humbled to be part of this festival with so many super talented film makers. If you are in the Los Angeles area, I hope that you will be able to attend. OMG! What will I wear? There is ONLY ONE Mr. Chico! Sometimes when things are the same for too long a person has to come along and change things. Lucy is just such a person. Oh boy, America surely does have talent. Went to a taping of America's Got Talent at the beautiful Pantages Theater in Hollywood. Some day I'll be one of the judges. Hmmmmm, I think Ramona would be a great judge, don't you? When you try and prover your usefulness to your friends you tend to come up with some pretty outrages things. K8 however just might come up this the most outrages of them all in her attempt to get friends. Who's sleeping with Joseph Gordon-Levitt? Video Game High School Awesomeness!!! The BEST hat in town! I had sooooooooo much fun filming with the remarkable cast and crew of Video Game High School Season 2!! OK, I actually arrived an HOUR EARLY to set (hey, I was afraid I was going to get stuck in rush "hour" traffic, so I gave myself a lot of time. 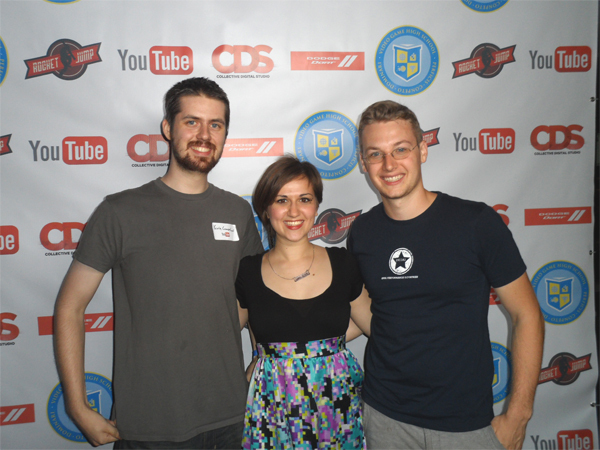 The moment I stepped onto the YouTube Production Studio Space, I was totally thrilled. I've been on a lot of sets and this one just vibrated with energy and happiness. It was unbelievably creative. I want to live there!! 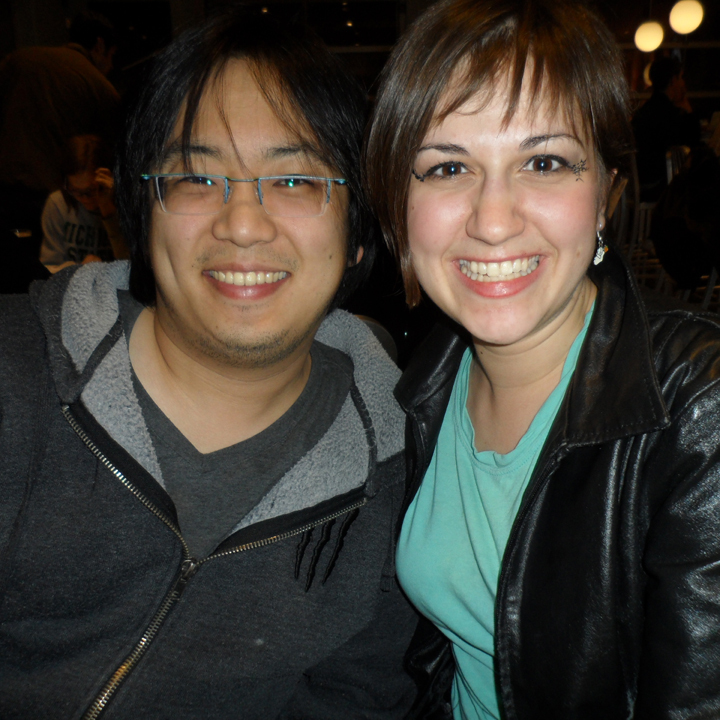 I met so many great people, including Freddie Wong himself and his super funny and talented brother, Jimmy Wong. I'll keep you posted on more of my adventures with this hot, hot web series. Til then, here are some fun pictures. 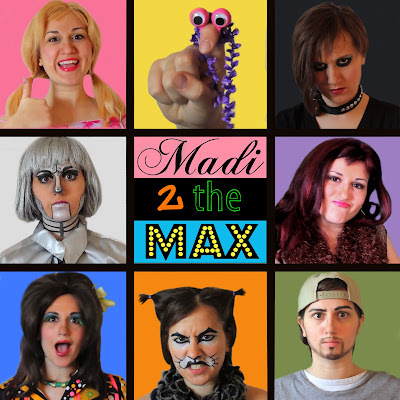 Hey, make sure that you go to my YouTube Channel and SUBSCRIBE so that you can keep up to date on Madi2theMax! Hey guys and gals. Here is my latest video on Madi2theMax. Subscribe, comment, like!! Eeeeeeeeek! I'm so excited. 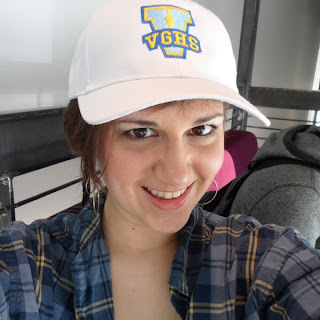 I'm going to be part of Season 2 of Video Game High School. I LOVE Freddie W and can't wait to play on set with all the fabulous people involved in this web series. 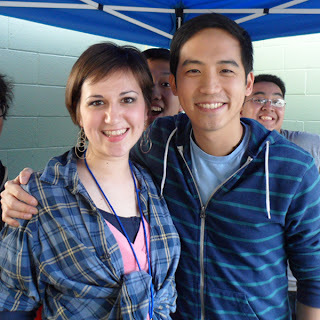 If you don't know anything about VGHS, check out episode 1. 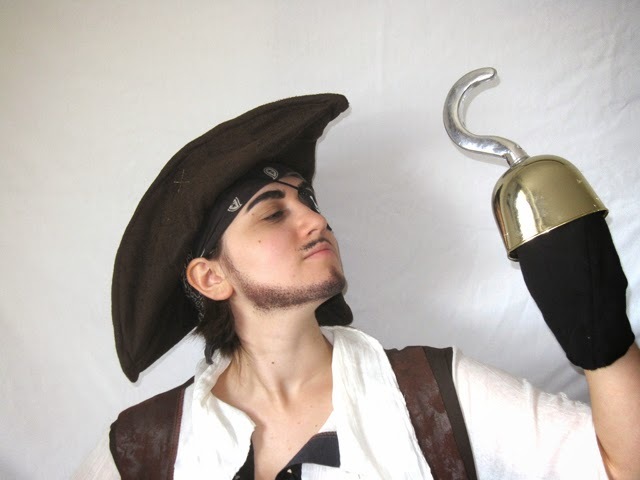 You'll get hooked. Also, just in case you don't know, Freddie W has made the coolest, most helpful after effects tutorials. You can learn so much from Freddie. 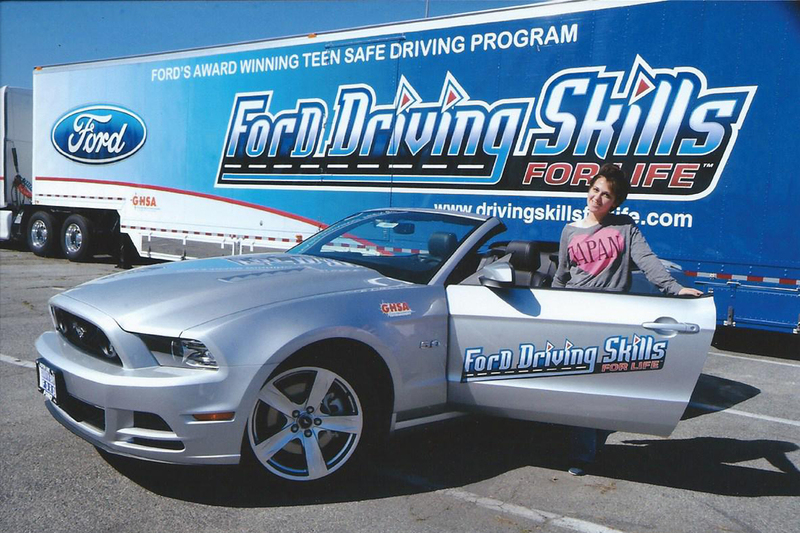 You can also go to Six Flags Great Adventure with him and ride the roller coasters. I LOVE getting my picture taken. In the studio with George DeLoache. 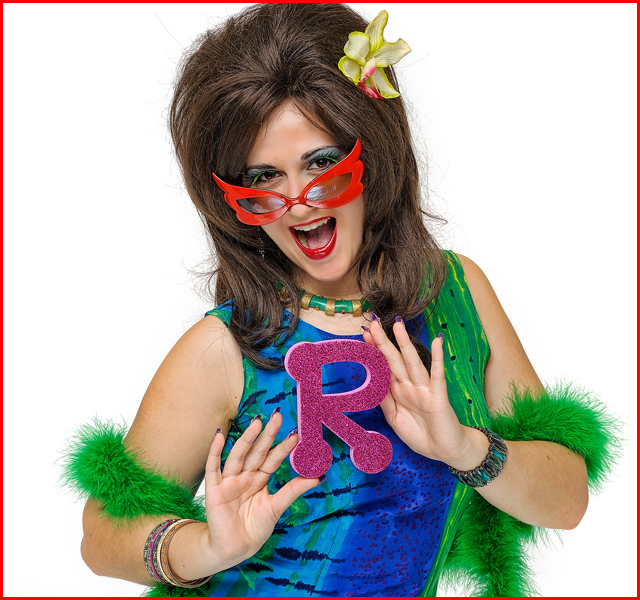 I simply LOVE this photo of my character, Ramona Bluebonnet. George DeLoache Photography completely captured the real Ramona. As Ramona would say, "OMG! George you are FABULOUS!" 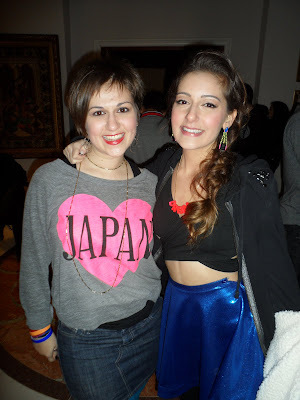 Gosh, had a great time up all night (both the name of the music video AND what we actually did) with Davina Leone. 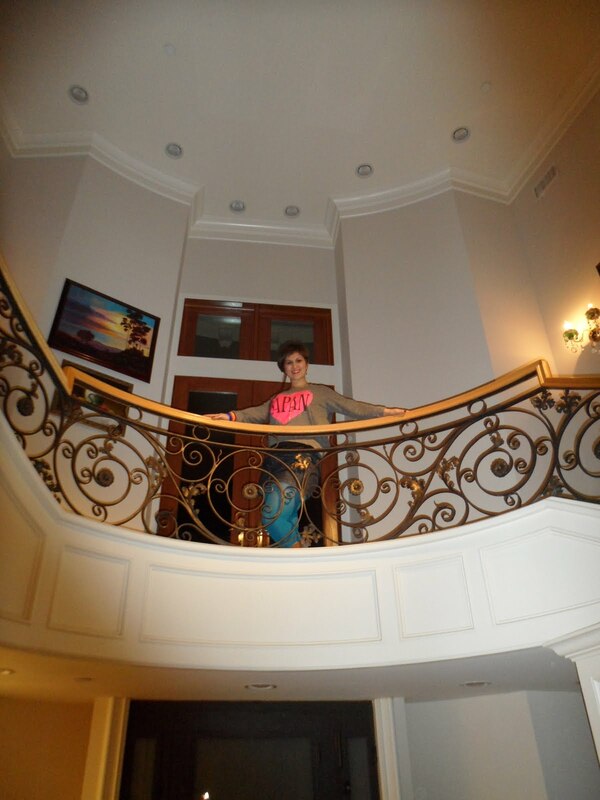 Shot the music video in this gorgeous Beverly Hills Mansion. It was freezing and the wind was blowing, but we all acted like it was just a lovely evening in the hills. So, Davina was super nice and we had a great time. Look for her to become a rising star. 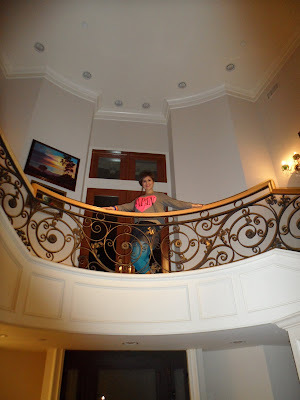 So, this is the mansion where we shot the video. Doesn't this just seem like I should live here? Me and the lovely Davina Leone. Which character do you like the best? 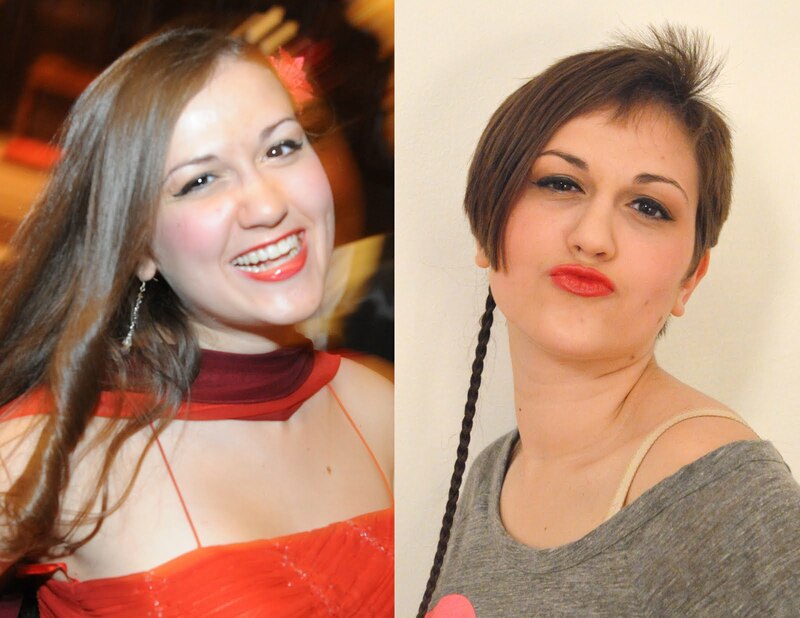 As I did the last time I cut off this much hair, I donated my long tresses to Locks of Love a public non-profit organization that provides hairpieces to financially disadvantaged children in the United States and Canada under age 21 suffering from long-term medical hair loss from any diagnosis. I'm glad to know that my hair is going to help someone. I had a blast making this parody music video. I hope that you like it too.